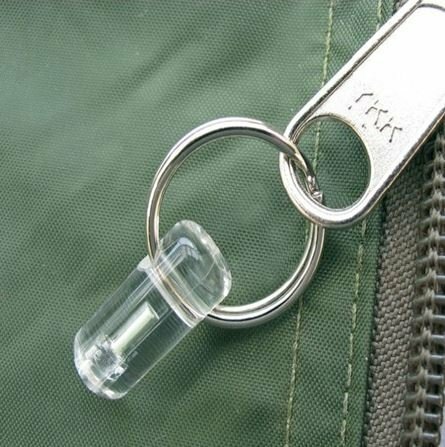 The Bivvy zipmarker is used primarily to locate key items of equipment which must be readily available at all times but which are easily lost in the dark. Standard markers are available with a range of brightness levels, from 80µL to 550µL. Markers can be supplied with green, blue, yellow, orange, red, white or ice blue lights. Refer to the marker specification sheet for product options. Kit location and identification in darkness. Survival scenarios: clear yet secure marking of equipment, stores and positions. Personal markers to enable visual contact during night patrols. Safety marking of ropes, paths, hazards and obstacles. Operation Markers are self-illuminating. They do not require an electrical supply, batteries or bulbs, and will remain continuously illuminated even during prolonged periods of darkness. Illumination is provided by Betalights, gaseous tritium light sources that provide an absolutely reliable luminance throughout their service life of 10 years. Maximum activity 8GBq. They contain no moving parts or consumable components (such as batteries, bulbs or switches). Markers are suitable for use in hazardous atmospheres and will operate normally in adverse environmental conditions, even when immersed in water. They are rated for operation in temperatures of -60 0C to 80 0C. Weight:Wire Loop Marker: 2 g.